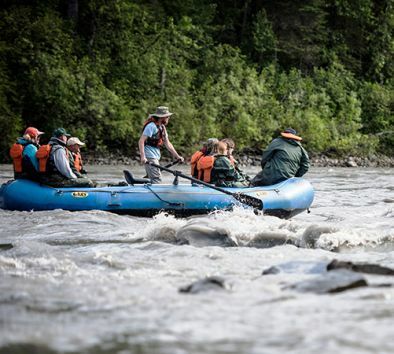 Enjoy an eco-friendly scenic float trip down the Talkeetna River. Meet with your guide for a brief safety lecture before launching and floating down six miles of pristine river. Your expert guide will take care of the rowing so all you have to do is relax and enjoy the ride! Since it’s a scenic float without whitewater, taking photos is effortless. You’ll slowly float through bear, moose and beaver territories, near salmon streams and active eagle nests. The beauty of Denali (formerly Mt. McKinley) and the entire Alaska Range provide a spectacular backdrop toward the conclusion of the trip. Dress in warm layers. Wear comfortable walking shoes. Wildlife sightings are likely but not guaranteed. Tour will operate rain or shine. Tour operates subject to meeting a minimum number of participants. Tour takes place in Talkeetna.